We use a simple illustrative example to show how Key Risk Indicators (KRI) and Loss Events can be used to estimate operational risk capital associated with a given risk. RCSA results. Computer failure: – Our RCSA exercise has determined a number of Key Risk Indicators (KRI). One of the key KRI is No of Computer Failure per month. Given the abundance of logs and monitoring systems we also have the data for such failures. KRI and its relation to Loss: – A relationship or map between KRI and its impact on business lines and their operations need to be developed so as to understand the impact and how this impact could create a risk for the company. To understand the relationship between this specific KRI and a given scenario we can use conditional probability to estimate the no of unsuccessful transactions that are not identified, rectified or corrected in time and that occurred because of a computer failure. 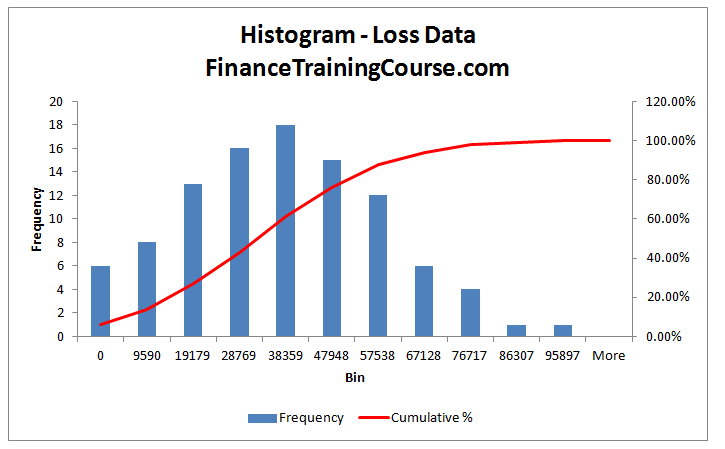 Loss Data: – Based on the frequency and severity estimation from using loss data from our system logs we can drill down to specific transactions and the amount of loss in dollar terms which has occurred for that given KRI. Capital Estimation Model: – The loss data can be collated for all KRI’s and then grouped by business lines and then aggregation of this data can be used to estimate capital for Operational Risk. Goodman Bank has setup a new Operation Risk management department. The first task of the bank is to find out potential processes, practices and activities which could lead to a risk and to find ways of risk assessment and control. In order to do that Risk Control Self Assessment (RCSA) is used. We start with finding out data regarding server outages from the IT department. We are able to find a list which has Server Outage details on daily basis, for the last 100 months along with the duration or downtime for the server. We understand that server outage can lead to a risk event, but do not find a direct relation with loss itself. Keeping this in his mind we look for a KRI which we have identified and an event which could be associated with that KRI and can lead to a loss. We looks into different processes across the RCSA entities and find that failed (incomplete) transactions that are not caught, identified, reported and fixed in time can be a possible event which can be related to server outage. In order to confirm our initial assessment we look for data related to failed (incomplete) transactions from the treasury trading and sales department on daily basis. The reason for using treasury department data set and servers is that unlike core banking and ATM network failures, we actually have a closed system within which the impact of a failed transaction can be easily quantified in dollar terms. In this table 0 and 1 denotes occurrence of fail transactions for a given day. In order to develop a relationship between the failed transactions and server outage, we need to see what the probability of failed transactions occurring is given that there is a server failure or outage. To calculate the conditional probability, we build another table which gives both failed transactions and server outage over a span of sixty day. Another column is added which is called the ‘joint failure’ column and takes the value 1 when there is a failed transaction as well as server outage and takes value 0 if none of the event takes place. The table is given on the next page. With the help of the given table we can compute the probability of failure of transaction given there is a sever outage or failure. The probabilities for above events can be found by dividing each one of them with total possible outcomes which give us .58, .46, .28 for FT, SF and FT SF combined respectively. This shows that 61pec Transaction failures are due to Server Outage or failure. Now that we established a link we now need to quantify the losses in dollar terms. 1) A failed limit update leads to a counterparty limit breach which is caught at day end and leads to the day end process being delayed. The delay leads to a vendor support call which gets charged out at the out of office overtime rate of the vendor as well as extended operating time at the treasury desk as well as the IT support group. 2) A failed transaction post leads to incorrect execution of a market transaction that has to be rolled back and re-executed at different market rates than committed to a counterparty leaving the bank with the mark to market loss on both ends of the transaction (roll back as well as re-exeuction). It can be seen that the loss data varies on daily basis and its value depend on the number (frequency) of failed transactions. Based on the conditional probability we found earlier we can find the average value of losses due to server outages over a period of month. This gives us an estimate of the loss amount which is due to the server outage/failure. By following the same approach Mike we make monthly loss data table for the last 100 month based on the daily data. 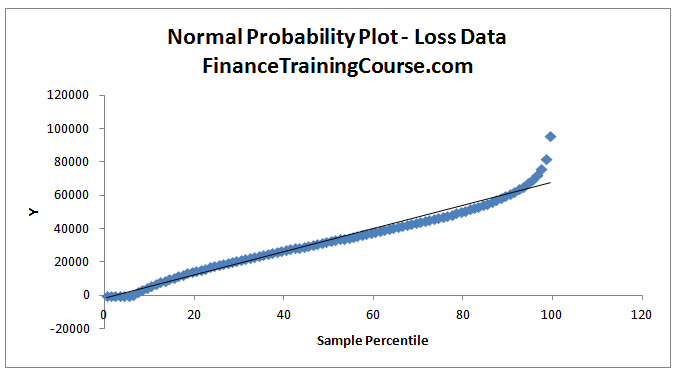 The Capital estimation can be easily done based on the loss data we have and the loss distribution approach can be used. The Cumulative Distribution Function (CDF) for the data set. From the histogram it can be seen that the data we have represent a normal distribution. To further investigate this we can have a probability plot which can be made through regression analysis in excel. The plot probability plot is given below. From the probability plot it can be seen that, even though there are some outliers but it is safe to assume that normal probability distribution is a good fit for our data set. Jan Lubbe and Flippie Snyman, “The advance measurement approach for banks”. Nigel Da Costa Lewis: “Operational Risk with Excel and VBA”, John Wiley & Sons .